A new job notification is coming for Tezpurians. Our assamjobalerts.com team are finding the latest job notifications for you day & night. Under Advertisement No. 01/2018 District Legal Services Authority, Sonitpur, Tezpur has invited applications from the local residents of the Sonitpur District in standard form along with two numbers of passport size photographs, for the post of Para Legal Volunteers (PLVs) at Sonitpur district, under District Legal Services Authority, Sonitpur, Tezpur. Application completely filled in all aspect should reach the office of the Secretary, District Legal Services Authority, Sonitpur on or before 16.07.18. The applicant should submit their mobile/ contact number, email ID for further communication. 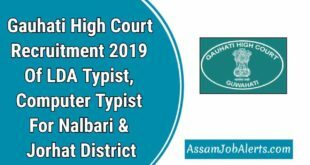 Candidate must be a citizen of India and a local resident of the Sonitpur District. The applicants educational qualification should be HSLC or equivalent examination passed. He/she should have mind-set to assist the needy in society and have the compassion, empathy and concern for the upliftment of marginalized and weaker sections of the society. Incomplete applications will be rejected without assigning any reasons. No. applications will be entertained after the last date fixed. The work of PLVs doesn’t carry any salary, remuneration or wage except honorarium fixed by the District Legal Services Authority, Sonitpur from time to time as per rules. The decisions of the Selection Committee in short listing the number of candidate for interview and selection of PLV shall be final. The eligible candidates shall have to appear for interview before the selection committee, the date of which will be notified in the official website. Selected PLO shall be required to undergo training programme as per decision of the District Legal Services Authority, Sonitpur. In case of any objection regarding selection of PLVs, the decision ofthe Chairman, District Legal Services Authority, Sonitpur shall be final and binding on all concerned. No TA/DA will be provided for appearing in the interview. Last Date for Receipt of Application:- 16.07.18.